I'm back! Back from a Thanksgiving week trip to Sweden and Iceland. I can't wait to share those adventures with you guys in an upcoming post. But for right now I have one very special holiday tip for you! Matcha. Matcha is my favorite holiday season escape. 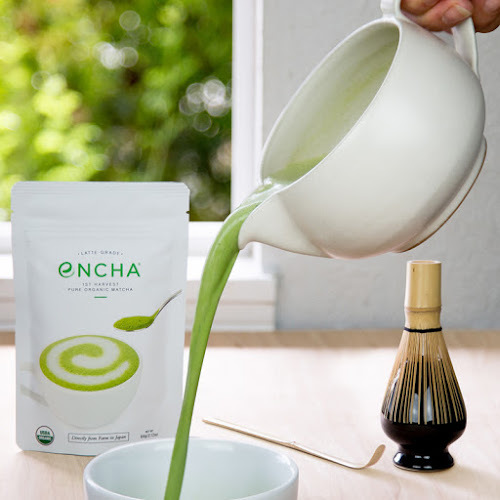 I curl up to a minty mug of this beautiful spring green Encha matcha and sink into tranquility for a few minutes. 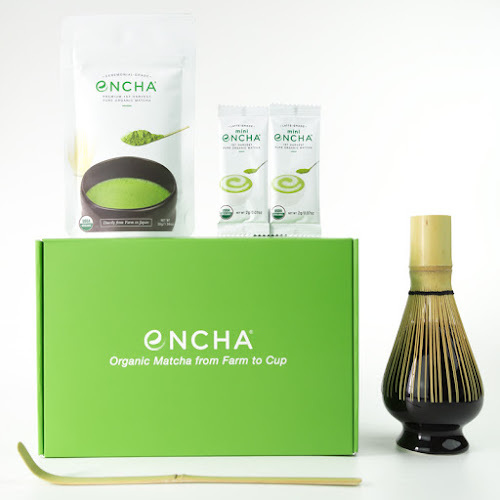 So today I am sharing a Candy Cane Nog Holiday Matcha Latte recipe, some tips for serving matcha to guests and my favorite holiday gifts from Encha! 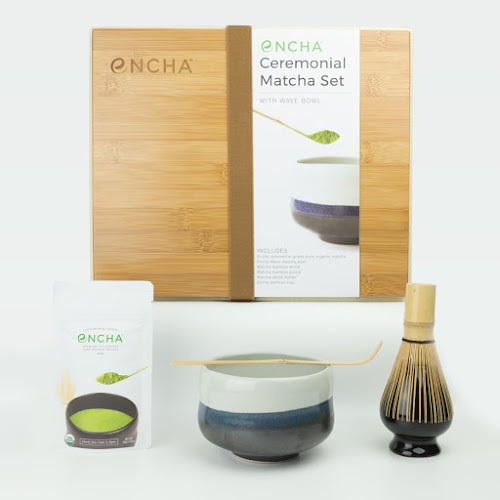 Oh and a pretty awesome giveaway too..
Why Choose Encha? Quite simply, it is the best! Ok, ok, more details.. When I first became a matcha fan a few years ago I spent months trying MANY different brands. 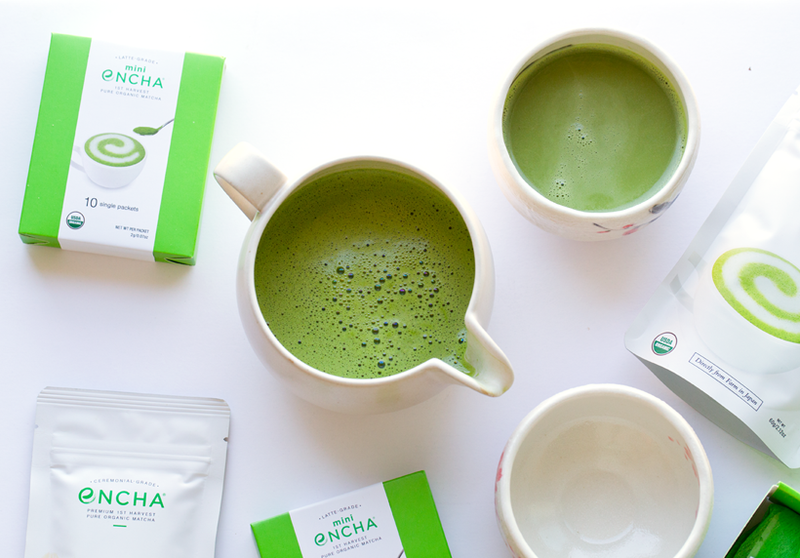 I scoured tea stores, ordered piles of matcha online and taste tested everything. I quickly realized that all matcha is NOT created equal. Many of the "discount" matchas you find online have awful color and taste and are a complete waste of money - they are very inexpensive for a reason! Matcha is such a delicate product. I mean you are grinding fragile green tea leaves into a fine powder. Imagine buying delicate organic raspberries from the market or fresh basil. Whoever is selling those sensitive products needs to take much care into how they are harvested, transported, packaged and more. Matcha is just like that. 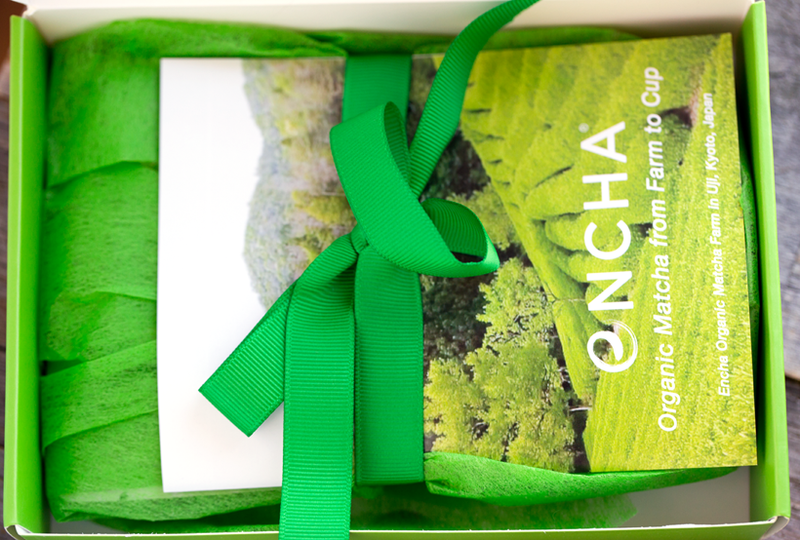 And Encha cares so much about sourcing, quality, packaging and value. 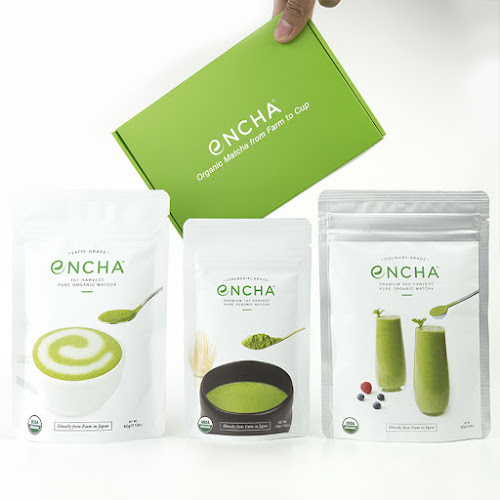 Encha is truly the best value for such a high quality matcha that I have personally found. And I adore the company and the brand mission and values. I hope everyone can get a chance to try matcha as it was intended to be served. Encha helps make that happen. 1. Have Options. I always like to have options for my guests. So instead of forcing everyone into matcha, they can choose it. I usually like to have herbal tea, hot chocolate and Nespresso pods on hand as well. Holidays are all about feeling warm and cozy and if someone wants chamomile tea at brunch or an espresso at 2am, I am more than happy to help out. But also, since I am obsessed with getting people to try matcha, I usually offer to make them a latte and if they don't want to finish it they don't have to. And usually, they fall in love with it and feel really excited for trying something new! 2. Start slowly. First matcha latte ever? Don't drown it in green. Start modestly. I usually do one teaspoon per large mug for myself. But for people who are new to matcha, a half teaspoon might be enough! You can tell the strength of the matcha flavor by the green color. The darker green, the more intense the flavor and matcha concentration will be. 3. Add flavors to accent. I love adding peppermint or vanilla accent flavors. 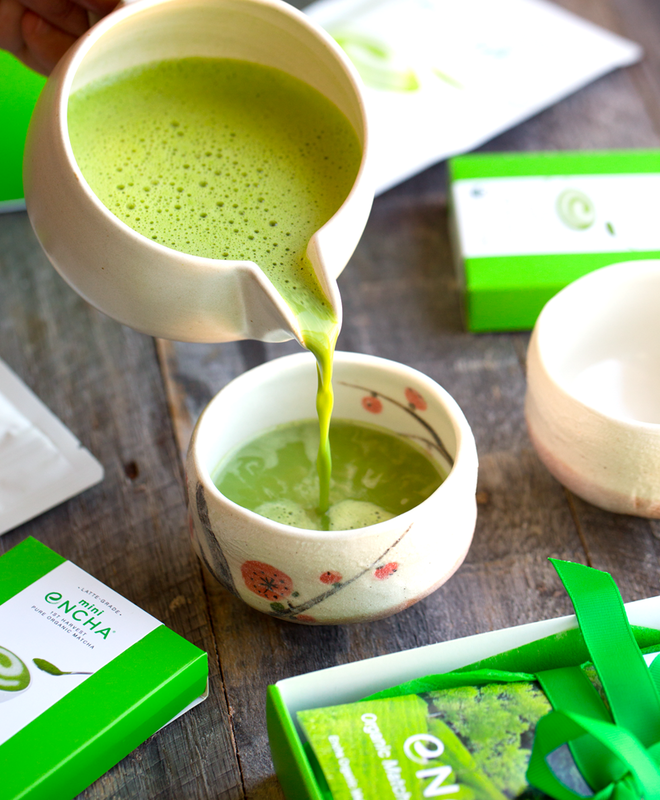 Flavors are great for new matcha drinkers because they offer a familiarity to the beverage. So along with the grassy, green tea-flavored matcha, you get something familiar. 4. Sweeten naturally and to taste. I love coconut sugar for sweetening matcha lattes. You can also try maple syrup or raw sugar or honey if you are not vegan. I like my matcha lattes on the sweeter side, but allow your guests to sweeten to their own tastes or ask them their preferences. For newbies, I really try to make it "sweet enough" when serving so the matcha flavor doesn't feel overwhelming. 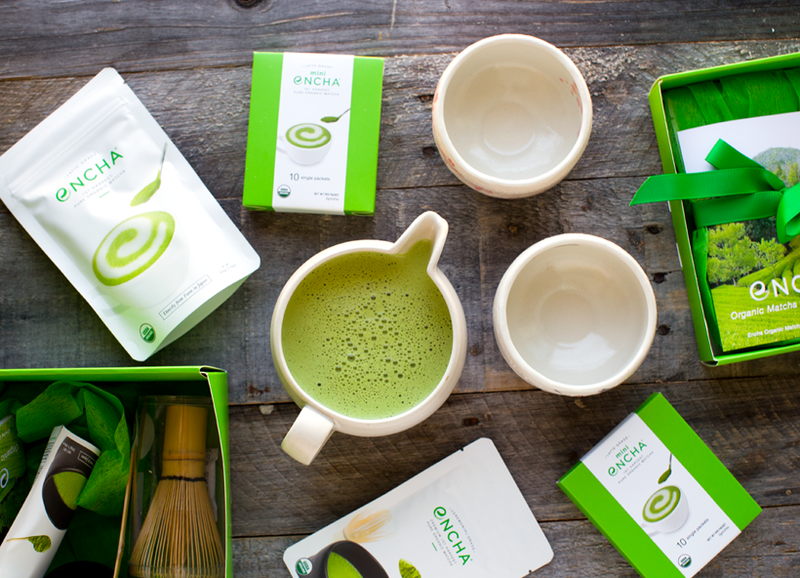 Some people say green tea can be an acquired taste. I remember loving matcha from the first sip, but upon rememberance, my first latte was on the sweet side. 5. Milk? I usually use Califia Farms unsweetened or original almond milk for my lattes. But organic soy milk is my favorite for creating really intense and fluffy foam and an extra creamy texture. You can also try oat or even coconut blend milks. Sometimes I do a mixture of water and milk when I want a lighter consistency to my latte. I hope those tips helped. 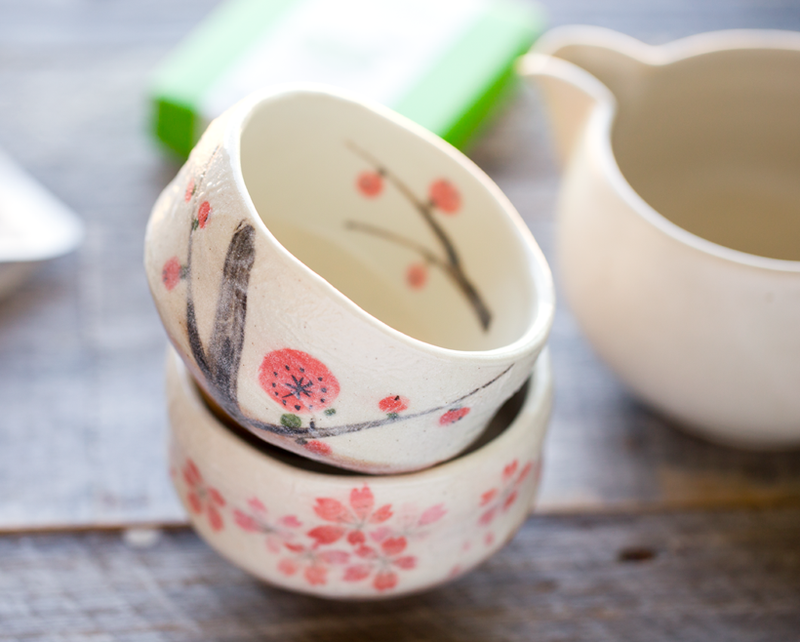 Now here are some really beautiful gifts that are available from Encha. Give the gift of Zen!.. Hope you can have some yummy matcha Zen this busy and sometimes stressful holiday season! 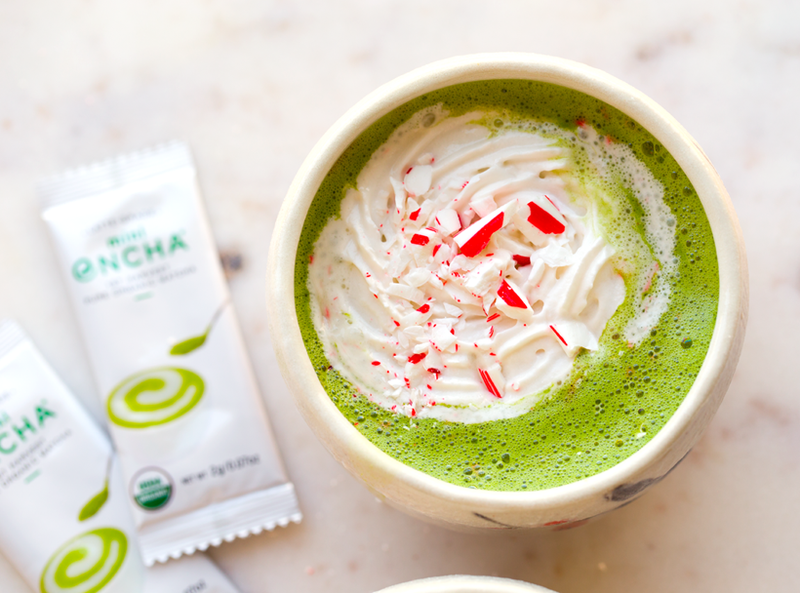 This light and minty matcha is my favorite for the holidays. 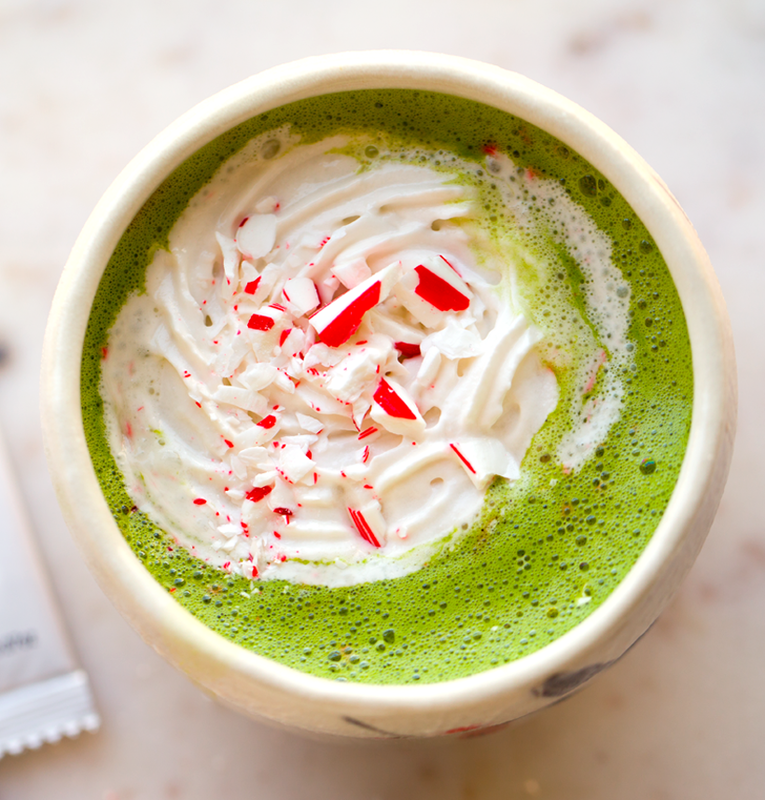 It tastes like candy canes and holiday nog and the best matcha latte ever all in one sip. Warm the milk to just under boiling. Add the matcha, peppermint, cardamom, sweetener and a few pinches of the candy cane to the warmed milk. Using a frothing device, blend everything together. 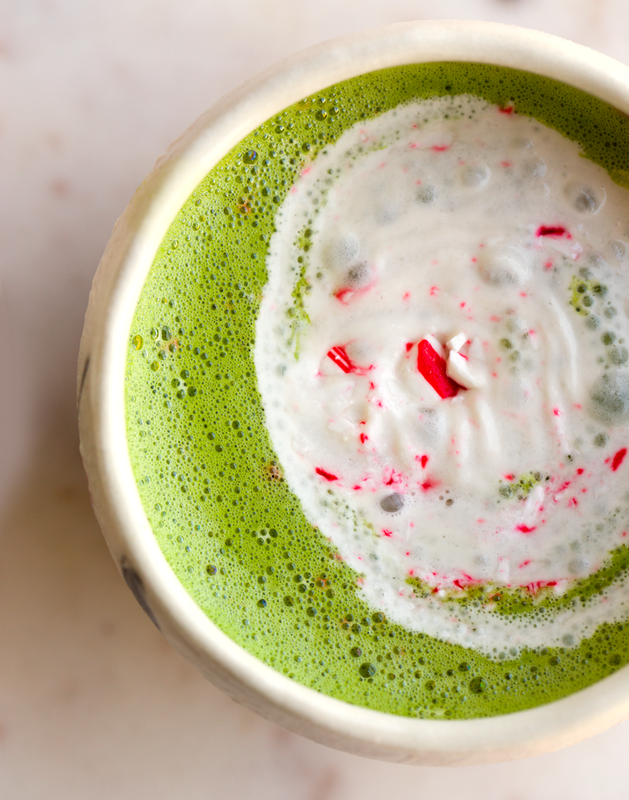 Pour the frothed matcha into serving cups and top with a swirl of non-dairy whip and a generous sprinkle of crushed candy canes. Serve warm! 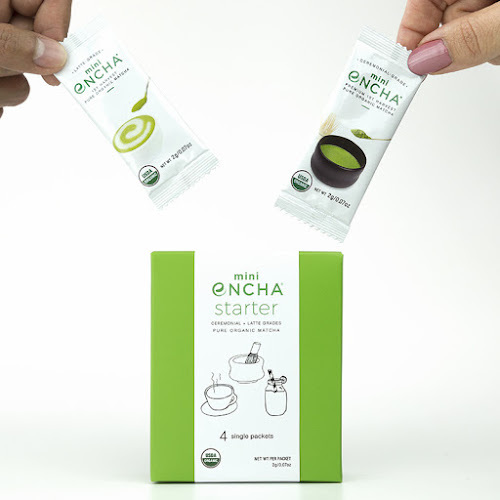 disclosure: This post is sponsored by Encha matcha as part of my brand ambassadorship, but all opinions are my own.